Before I even listened to this it had one thing going for it; investigation had turned up that this band were favourably compared to an act I have a real passion for. I shout loud my love of Delain and when something is described as sounding similar you can bet your backside I'll be having a listen! 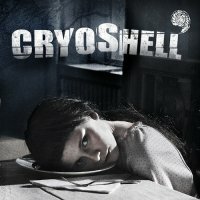 Cryoshell hail from Denmark and are described as an Alternative Hard Rock band that dabbles with a bit of Symphonic and Pop. They actually started life in 2006 as a collection of musicians for marketing campaigns. Their self titled debut, (produced by Jacob Hansen), originally came out in their homeland in 2010 and has slowly been released in different countries and now worldwide. It's difficult to select a few tracks because they are all equally contagious. If there's a 'best song' it would probably be the single 'Bye Bye Babylon'. There's a cascading riff and textured keys that plays an almost Egyptian-esque melody before a verse that drops in density with soft, chiming guitar. Everything slowly picks up then POW...the songs bombastic chorus touches down like a twister. Another real ripper, (apologies...too much Ashes cricket), is the aggressive 'Come To My Heaven' which sees Christine Lorentzen using vocal effects as the funky guitar riff and pounding drums sound like an amped up Frankie Goes To Hollywood. Its chorus has another likeable vocal line along with a very bouncy progression. The piano in 'Murky' brings lightness to a song that would be quite imposing otherwise. The bridge and ending could make a grown man cry where the piano cascades up and down whilst Lorentzen wails to the highest levels. This is all before I even mention the Alternative and groovy 'Creeping In My Soul', the powerful 'Closer To The Truth' and the infectiously beautiful 'Falling'. You can keep the bacon and the Carlsberg; I've developed a craving for another Danish export. This debut is not quite in the same class as the almighty Delain but it's still a superb album that grabbed my attention as quick as when someone offers to get a round in. I concur there's a resemblance to my Dutch heroes with Cryoshell offering similar pop structured songs in a Heavy Rock/Metal overcoat. The songs are full of catchiness and each one of them snuck into my mind for different reasons. I'd love to put 'Babylon' and 'Heaven' on full blast and walk around the day job office encouraging everyone to let rip. Now that's team building using the FW method! This is one album I can fully recommend to my fellow Delain enthusiasts and any other fans of that style. It's more commercial in places and more Alternative in others but make no mistake this is a bit of a corker and one I feel will be getting lots of plays in the future.